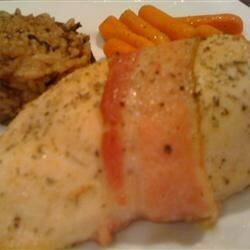 "Chicken breasts stuffed with soft cheese, wrapped in bacon, and drizzled with honey. Very easy and tastes amazing. I have lost count of the amount of times I have made this. It's a family favourite, and goes very well with either roasted vegetables, such as aubergine, peppers, courgettes, etc., & sauteed potatoes or salad and potato salad." Cut a slit in each chicken breast, and stuff with equal amounts Boursin cheese. Wrap each breast with 2 slices bacon. Secure with toothpicks. Arrange on a baking sheet. This recipe has some possibility...as is it has almost no flavor. The parts of the chicken with just honey on it is too bland...adding some spices or breading and cutting the honey might help. I loved this recipie, but I added a little bit of velveeta to the cheese inside the chicken! It was de-lish!! !